This article is a short summary of Mario Party 8. 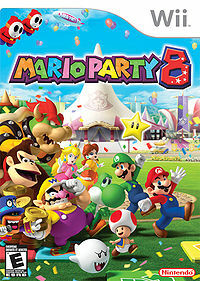 Mario Party 8 is the eighth main installment in the Mario Party series, and the first installment to be released for the Wii. The game was developed by Hudson Soft, and released in 2007. It's the wildest party ever! The Wii Remote™ gets minigames moving! Score in a shooting gallery! Plus extra games that your Miis can play! It's a party for the whole family starring Mario. The world’s most popular party video game franchise is getting a lot crazier in Mario Party 8 for the Wii. Whether you’re shaking up cola cans or lassoing barrels, you and your friends will be drawn into the action like never before using the Wii Remote! Play with motion control! Row your way down a river, punch a statue to pieces, steer race cars and mopeds, and handle a balancing pole while walking a tightrope! Play with the pointer! Drag and drop decorations onto cakes, shoot Boos in haunted house, quickly choose your answer in a game show! Mash those Wii Remote buttons! Jump and pummel your way through a football brawl, hop and run across an obstacle course of spinning platforms! In a franchise first, you can collect special power-ups and transform your character into a boulder that smashes rivals or a coin-sucking vampire! Mario Party 8 includes “extra-large” minigames like Star Carnival Bowling and Table Menace. Mario and friends are at the Star Carnival, hosted by MC Ballyhoo and Big Top, to compete in the Star Battle. The winner will be crowned the Superstar and receive a year's supply of candy. The gameplay of Mario Party 8 remains similar to past games. Players move around a board, collecting coins to buy Stars, and the player with the most Stars by the end of the game is the winner. Players can earn coins by winning minigames, many of which take advantage of the Wii's motion-based gameplay, or by landing on certain spaces. Also like with past games each board features its own style of gameplay, and there is no longer a game-wide gimmick such as the day/night system in Mario Party 6 or the Bowser Time event in Mario Party 7. Replacing the Capsules/Orbs from Mario Party 5 onward is Candy, which like orbs all have their own unique effects on the player to give them an advantage. In addition to the main party mode, also available is Star Battle Arena, the game's single-player mode; the Minigame Tent, in which players can play various minigame-based modes; the Extras Zone, in which players can play a set of extra minigames; and the Fun Zone, in which players can access various other extra content. In the United Kingdom, copies of Mario Party 8 were recalled from retailers at release by Nintendo of Europe due to the word "spastic", used as an offensive slur toward disabled people, appearing in a line of dialogue. According to Nintendo, this was the result of a factory error. The game was finally re-released on August 3, 2007, with the offensive word being replaced with "erratic". ↑ Mario Party 8 – banned!. Thunderbolt (July 13, 2007). Retrieved August 15, 2015. This page was last edited on 1 November 2018, at 10:37.